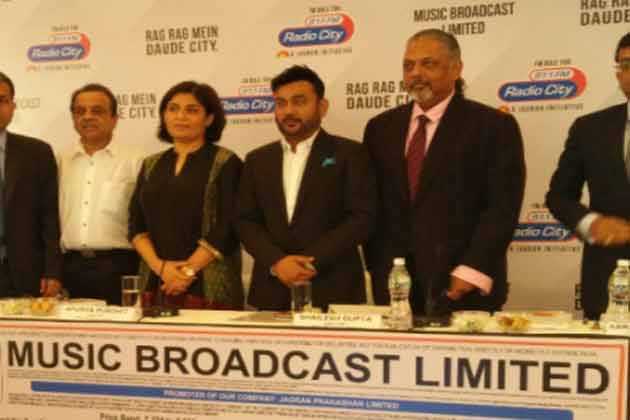 Radio City, a part of Music Broadcast Limited (MBL) is a subsidiary of Jagran Prakashan Ltd. Radio City was the first FM radio broadcaster in India and brings with it over 17 years of expertise in the radio industry. Amongst the private radio stations, Radio City has consistently been the number one radio station in Bengaluru and Mumbai with 24.17- and 17.10- average listenership share respectively. (Source: TAM Data – Radio Audio Measurement, Markets: Mumbai and Bangalore TG: 12+ Day-part: Mon-Sun 12:00 AM-12:00 AM, Place: All; Period: from December 30, 2012 to January 21, 2017) and as on March 31, 2017, Radio City reached out to over 67 million listeners in 34 cities covered by AZ Research (Source: AZ Research Report). Music Broadcast Limited currently has 39 stations, including 11 newly acquired stations in Phase III auctions. Radio City in its third phase expands to Kanpur Ajmer, Kota, Bikaner, Udaipur, Patiala, Patna, Jamshedpur, Nasik, Kolhapur and Madurai. Radio City has spearheaded the evolution of FM radio programming by offering content that is unique and path-breaking. The network introduced humour and the concept of agony aunt on radio with Baber Sher and Love Guru respectively. It also initiated the Radio City Freedom Awards and provided a launch pad to budding singers with Radio City Super Singer, the first-of-its-kind radio talent show in India. Through its ‘Rag Mein Daude City’ philosophy, the network has adopted a local approach that resonates with the listeners while inculcating a sense of city pride and infusing local culture and flavour on-air. The network provides terrestrial programming along with 52 other web-stations, through its digital interface, www.radiocity.in. Radio City has been featured consistently in ‘India’s Best Companies to Work For’ study conducted by Great Place to Work Institute. The network has repeatedly been called out as amongst the best in the media industry. In 2018, the company was included in the list for the 7th time, according to the GPTW survey in 2018, Radio City ranks 8th amongst the 100 Best Companies to work for in the Media and Entertainment Industry as well as the best career management. Launched in August 2008, radiocity.in is India`s Music Portal. The first web radio station Radio City Fun Ka Antenna was launched in March 2010. Our web radio stations offer 24 hours of uninterrupted streaming internet radio and Live RJ hosted shows. Apart from Radio City Fun Ka Antenna, radiocity.in has 40 other web radio streams. The website also features, news, videos, access to Radio City RJs, Shows, Radio City properties and exclusive scoops on celebrities at Radio City reaching out to 12.2 Million as of 30th September 2016. In June 2013, Radio City launched a, ‘PlanetRadiocity’ mobile app that plays Radio City Freedom, Radio City Smaran, Radio City Malayalam, Radio City Metal, Radio City Wellness & Radio City Electronica. The app archives all the popular PPFs of Radio City like the hilarious Babber Sher which has a nationwide fan following. City centric features like the famous ‘Punch Patela’ (Bangalore) and ‘Hunter’ (Ahmedabad) can also be enjoyed through the app. Rare and exclusive videos of star visits to the Radio City studios along with Bollywood news, are added attractions. MBL was incorporated as ‘Music Broadcast Private Limited’ on November 4, 1999, as a private limited company under the Companies Act, 1956. It was converted into a public limited company pursuant to a resolution of the shareholders at an extraordinary general meeting held on June 15, 2015 and consequently, the name of the company was changed to Music Broadcast Limited. Ms. Apurva Purohit is the President, Jagran Group. Jagran Prakashan Ltd (JPL) is India`s leading media and communications group with its interests spanning across Print, OOH, Activations & Digital covers all of India as its footprint – and is amongst one of the largest media conglomerates in the country. Jagran group publishes 10 print titles in 5 different languages spread across 13 states with over 400 editions and sub editions these include some veritable titles as the World`s largest read daily, India`s No.1 compact daily and India`s No.1 Urdu daily.